The time-line of the Bogan's of Crawford County, Ohio, their origins in Europe and migration from Germany, to North America, and from Maryland, to Virgina, to Ohio and settlement in Crawford County. Database containing my Family Tree. (2) Davidson-Hall families of Montreal, Quebec. To select the database, click on the Home icon at the top of the page. -- At present (2014) the Bogan database has over 2000 persons in it. 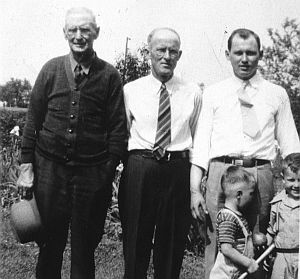 Some of the surnames of more recent families are Bogan, Pfahler, Smith, Van Voorhis, Cooper, Kunkel, Fetter, Schwab, Kehrer, Albright, Cook, Kester, Buchlacker, Wise, Volkmer, Liapply, Bauer, Siebert, Reber, and Plank. Several related families are included such as Crall, Baerkircher, Bryant, and others. -- The Davidson database traces the families back to Great Britain and includes Wilson, Hall, Bodfish and related families. Note: The software does not show living persons even though they are in the database. You must request a username and password to see this data - related persons only. I have written small essays (stories) on individual families and generations of the families in my past. These link together the facts that are buried in the genealogical database listed below. The wiki format makes for an easier to view the relationships and events of the Bogan, Kehrer, Reber, and Pfahler ancestry. The wiki also includes maps, descendencies, pedigrees along with time lines. These are connected with hyperlinks. Many of stories are improvements on ones written earlier and put on the Stories page. I have put up some of the older photos that I have inherited from my family. These include pictures of ancestors, some of their reunions, and some other images such as school cards and buildings related to the family. Some of the images are used as portrait photos in the Database linked above. Pedigree of the Davidsons of Lachine, Quebec, Canada. This page shows the direct ancestors of the Rupert Davidson family. All of these ancestors came from the United Kingdom, mostly from Scotland and England. Names include Davidson, Hall, Bodfish, Wilson and others. Pictures of city buildings from the Advertising Book produced by "The Bucyrus Industrial Association" of Bucyrus, Ohio in 1911.